In advance of last weeks Prototype Modelers Conference in Naperville, I had the opportunity to operate on Bill Darnaby's layout, The Maumee Route. I've been keen to run on this layout from the first time I saw it a few years ago and it certainly did not disappoint. Bill has said that the whole point of the layout was to allow modelers to run realistic Timetable and Train Order operations. Stations are placed far enough apart to create a sense of distance and the layout design assures that operators can't peak down the line to see if the line is clear. Combine that with Bill's extensive modeling talents and the layout is true masterpiece. One has to read and understand the schedule, the train registers and any train orders issued to be able to proceed on the line and avoid collisions. As you roll by the stations on the layout you have to check the train order boards for orders. I can tell you that as a neophyte on the layout there was, at times, a high level of internal stress as I struggled to remember all the little details I was required to concern myself with. I'm happy to report that I was not responsible for any impromptu meetings of equipment, but I did neglect to sign the train register for one arrival towards the end of the session. (Sorry Bill). While I have much more to learn about TT&TO operations, I now feel that I've got a better handle on the whole process and am getting closer to being able to implement TT&TO on my Wabash layout once it's ready to roll. I hope to be invited back in the future to repeat the experience and will put the lessons learned to good use with the Cayuga Sub of the Wabash in due course. I've been spending the morning getting sorted out and reorganized following my return from almost a week in Naperville IL where I was participating in the Railroad Prototype Modelers Conference. An annual event , now hosted by Joe D'Elia, where prototype modelers from all over the US and Canada get together to discuss trains and how best to model them. 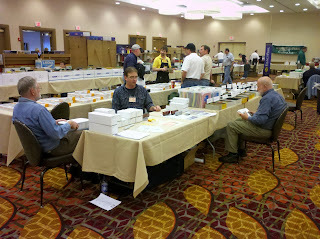 Wandering the halls are such well known modelers like Andy Sperandeo, Tony Koester, Tony Thompson, Richard Hendrickson, etc. Over the course of 3 days 42 separate speakers give clinics on a huge variety of topics, from Freight car trucks to passenger operations on the ATSF. Frankly I can't say enough about this event. I have attended at least 8 times now, when the personal schedule permits, and have always come away with new knowledge and new modeling friends. It's also an opportunity to renew relationships with people from the other side of the continent. I know that some are scared away by the notion of spending days with a "bunch o rivet counters", but it's much more than that. Just to visit the display room is a treat onto itself. Spectacular modeling and a venue to exchange ideas and techniques. On the Saturday, after I gave my clinic at 9:00 am, I dashed off to the sales room to man my table. I was selling Wabash stock car kits and etched ladder stiles and eyebolts. Within 1/2 an hour I was sold out of 2 of the 4 ladder styles I had brought. The rest of the ladders were gone by 1:00. Good thing I had ordered more etchings before I had left home. Looks like I got this one right! The photo shows the table in the afternoon with Al Ferguson anchoring the corner with his decals and my good friend Bill Welch perusing photos on the other side. In the end I came home with only 3 kits from my line and a few of the SC&F tankcar kits I was selling for Jon Cagle. On that note, I will have a few SC&F tankcar kits available for sale now. Built or unbuilt. As you wish. What you see will be Yarmouth Model Works next kit. The CPR 223950 plywood sheathed car. This was a wartime build, using 5/8" plywood in lieu of steel plate for side sheathing. The use of plywood saved over 2000 lbs in weight and retained the full interior width. The panels were afixed through steel straps overlaying the side panels using a distinctive double row of rivets. Aaron Gjermundson has faithfully recreated the look of this unique car in creating the patterns we'll be using. The kit will feature the same kinds of details seen in our Wabash stock car. Laser cut running boards, Tahoe Model Works truck frames, Black Cat decals, photo-etched ladder stiles, stirrups and other details. If all goes well, this kit may be ready to ship before Christmas. Check in to the website to see when this kit will be ready. My good friend Trevor Marshall spent the day with me and we wired and tested the towns of Courtland and Delhi. A very successful procedure and a nice change from building cars for day. It was hoped that today was going to be a banner day. Where we ran a Red Ball from one end to other. Sadly not to be. In the excitement and anticipation I had forgotten that I have yet to wire the town of Jarvis. Sigh. That will take me about a day and then we can roll trains. All that will no doubt have to wait until after Naperville. I have to finish my presentation amongst other things.